I have been keen to experiment again with the native bedstraws but, since we moved house and I left my precious dye garden behind, I have been finding it difficult to harvest suitable bedstraw roots. The roots of the Lady’s Bedstraw (Galium verum) plants that I have planted in my new garden are too immature and it is against the law to uproot plants in the wild, so it seemed that any experiments might have to wait a year or two for my own plants to be ready to harvest. However, thanks to the generosity of Leena Riihela in Finland (www.riihivilla.com) who kindly sent me some roots from her own garden, I have been able to experiment with Hedge Bedstraw, (Galium mollugo). Compared with the roots of madder (Rubia tinctorum), bedstraw roots are very fine and delicate, and these bedstraw roots were very precious as they had come from such a long way away. So I wanted to make sure that I didn’t waste them. I decided to work in this way, rather than combining all the extractions, because my belief is that the richest true reds lie under the yellows and browns and the best way to get reds is to first use up these yellows and browns. I don’t know whether this belief is correct but my experiences suggest it seems a good way to get reds rather than oranges. I now use this method when dyeing with madder and it seems to work well. After washing the madder roots well, I simmer them to extract the colour for the first dyebath, remove the roots to use again for a second dyebath and then reduce the temperature before adding the fibres. 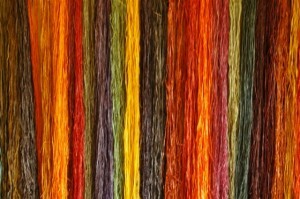 Once the fibres have been added, I don’t simmer the madder dyebath and I keep the temperature hot but not too hot – i.e. well below simmering point. The roots can then be simmered again to extract more colour for a second dyebath. Indeed, madder is a most generous dye and the roots can often be simmered several times before the dye is exhausted, giving colour for yet more dyebaths. 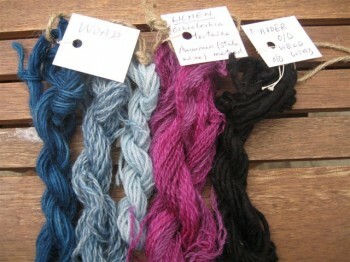 I think that, when I next dye with the bedstraws, I will probably keep things simpler and try something closer to the method I use with madder. So, after soaking the roots overnight, I will simmer them once for about 30 minutes and use this solution for my first dyebath. I will then simmer the roots again (probably for about 45 minutes) for a second dyebath and to make sure no precious dye is wasted, I will simmer the roots at least once more for a further dyebath. But first I must wait for my bedstraw roots to be mature enough to harvest. A close-up image of some of the Hedge Bedstraw colours. Thanks to Helen Melvin’s booklet on indigo dyeing, “The Colour of Sea and Sky”, and Helen’s comments on the merits of making an indigo stock solution, I decided to experiment again with this method of making an indigo vat. This was the method I first used with indigo over 30 years ago and Helen’s book reminded me of the advantages of the stock solution method, among them the fact that indigo reduces more efficiently in a concentrated alkaline solution and there is therefore less likelihood of wasted, undissolved indigo. Also, using a stock solution means that the colour can be built up relatively easily. So why did I stop using the stock solution method? The main reason is that the one-step-bath method I generally use now, and which appears in my books, is more practical for one-day workshops, as the vat is quick to make and this enables me to demonstrate how to make and use an indigo vat in a short space of time. However, after we have used this vat there is often some indigo remaining, which gets thrown away, (unless students can take some solution home with them). Indeed, I often tell students that this vat is even better on the second day, as the indigo has had more time to reduce completely. The other reason for abandoning the stock solution method is my desire to avoid the use of caustic soda, which can cause bad burns if not used with great care. Helen’s stock solution recipe is quite simple and involves mixing 50gms of indigo powder with 2 tablespoons each of caustic soda (the alkali) and thiourea dioxide (the reducing agent). For my stock solution I used sodium hydrosulphite (hydros) as the reducing agent and this also works perfectly. I first mixed the indigo powder to a smooth paste in 4 tablespoons of very hot water in a large heatproof jar. I then topped this up with hot water but no hotter than 50C, which is about as hot as a hand can tolerate. (NOTE: Don’t fill the jar too full and leave enough space for any bubbling or fizzing that may occur.) Then I very gently stirred two tablespoons of caustic soda into this solution, followed by two tablespoons of sodium hydrosulphite (or use thiourea dioxide instead of hydros). This is the stock solution. NB Remember to wear rubber gloves and bear in mind that both caustic soda and the reducing agent should be added carefully to water and never pour water directly onto them. Keep the jar warm and after about 45 minutes the stock solution mixture will become a clear amber colour, although the surface, which is in contact with oxygen from the air, will be a dark blue colour with a lustrous sheen. The stock solution is now ready to use. To make the vat, fill the container up with water no hotter than 50C, add a teaspoon of hydros (or alternative reducing agent) and a teaspoon of washing soda and allow to stand for a few minutes. Then gently stir in one or more tablespoons of stock solution, according to the size of the vat and the depth of blue required. The vat can then be used as usual and more indigo stock solution can be added as necessary. Further information on making and using a stock solution and many more recipes can be found in Helen’s booklet “The Colour of Sea and Sky”, which I highly recommend. And of course, like all Helen’s books, it has a lovely hand-painted cover. The photos below show, from the top: the frozen viola flowers ready for colour extraction, the dyed materials (silk on the left and cotton on the right)), a closer view of the dyed silk fabric, and finally a closer view of the dyed cotton fabric. 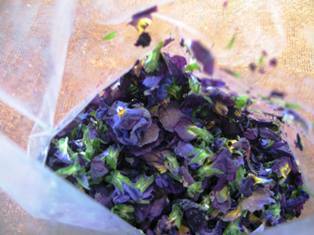 The dyed skein is cotton and the dyed cotton fabric is the bag in which the flowers were tied. The attractive variegated colour effects on this bag are probably the result of the flowers being pressed against the fabric. 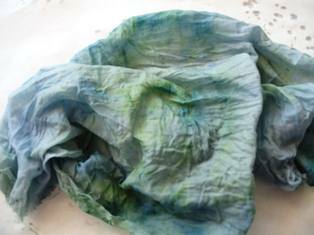 As with the leaf prints, I must test these ice-flower dyes for light- and wash-fastness, once the colours have had time to mature. Recently I was inspired by India Flint’s book “Eco Colour” to experiment with leaf prints. India’s book contains a wealth of ideas and is full of beautiful images of her printed fabrics. 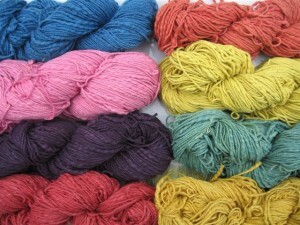 This fascinating technique has become very popular among dyers and can have really lovely results. I collected some leaves from my garden, mainly from a eucalyptus tree and a Judas tree (Cercis siliquastrum), and used cotton and silk fabrics mordanted with alum. (I decided to pre-mordant the fabrics to improve the fastness of the colours.) I placed the leaves on the wetted cotton fabric, added a few rusty nails, put the silk fabric on top of the cotton fabric and then carefully folded the fabrics into a bundle, which I tied with string. I decided to put this bundle into the compost bin my husband uses for grass clippings, as it can get quite hot in there and this therefore seemed a useful way of setting the dyes. After four days, I removed the bundle to reveal the results below. Now I need to do some light- and wash-fastness tests to see how fast the colours achieved from this method will be. 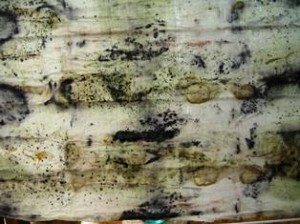 The first photo shows a section of the cotton fabric and the second photo shows a section of the silk fabric. It was a pleasure to return in June to the Bedfordshire Guild of Weavers, Spinners and Dyers, of which I was a member for over thirty years before we moved to West Sussex. 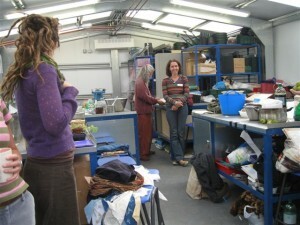 The occasion was an indigo workshop I was leading and I was delighted to see old friends and to meet some new members. To demonstrate the various sources of indigo dye, I made several vats using natural indigo, synthetic indigo, woad leaves, woad balls and stored woad solution. I used the Colour Run Remover recipe given in my books with the synthetic indigo. However, as Colour Run Remover is not always easy to find in powder form (the liquid form isn’t suitable for indigo vats), I decided to try a different method with natural indigo. I was looking for a simple method and, after some experimentation, it seemed that using equal quantities of indigo powder, washing soda and sodium hydrosulphite (hydros) would work well. An added advantage is that using equal amounts of each ingredient makes this a very simple recipe. As indigo reduces better in a more concentrated solution, I decided to make a stock solution on the day before the workshop. To do this, I mixed 4 teaspoons of natural indigo powder with very hot water to make a paste. Then I dissolved 4 teaspoons of washing soda in very hot water in a strong glass jar, added the indigo paste and stirred well. I added more hot water until the glass jar was just over three-quarters full then, after checking that the temperature was not above 50C, I carefully stirred in 4 teaspoons of hydros and put the lid on the jar. I then placed the jar in a saucepan of very hot water and put this on a hotplate overnight. In the morning I checked the pH and added more washing soda to bring it to pH9. The solution looked a murky greenish yellow at this stage. When I arrived at the workshop, I filled a stainless steel bucket with very hot water (but no hotter than 50C) and added 2 teaspoons of washing soda and two teaspoons of hydros. I then gently added the contents of the glass jar. The vat was allowed to stand for about 20 minutes until the liquid below the surface was a clear greeny/yellow. (If this seems to be taking too long, add some more hydros.) This vat is very simple to make and worked well. However, I intend to experiment further to see if I can improve on this method. Both of the indigo vats produced dark blues immediately and those students who wanted paler blues had to wait until some of the blue had been used before dyeing their samples. I also suggested that the wool samples should be dyed first, while the vats were hot, and that the cotton and silk samples should be dyed later, when the vats had cooled down. This is because wool takes up the indigo dye better in a hot solution, while cotton and linen prefer cooler solutions. With the woad balls I used the recipe given in the revised edition of “Wild Colour” and also in an earlier post on this blog. 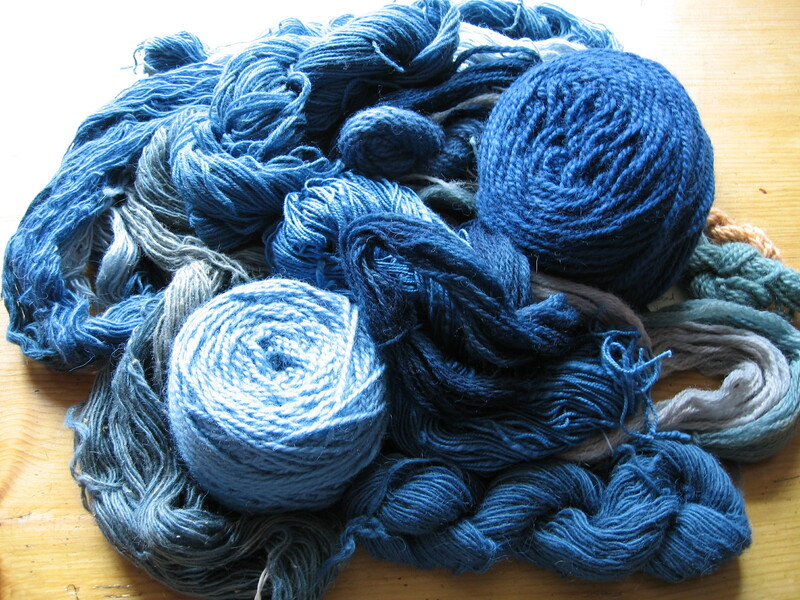 Unfortunately, the woad balls only produced a pale blue and not enough for all the workshop participants to dye their samples. I think the balls probably needed to steep for a longer period than we had available. 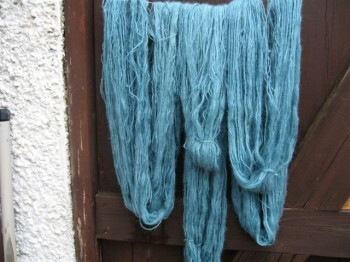 We also had limited success with the fresh woad leaves, which gave very little colour. However, I suppose this was to be expected, as June is really too early to harvest the first year leaves, which hadn’t had enough time to develop their colouring potential. The woad solution, which gave deep to mid blues, was from 2008 and worked very well, so this proves (if proof is necessary) that correctly-prepared woad solution can be stored successfully for several years. The recipes I used for these two woad vats were those in my books. 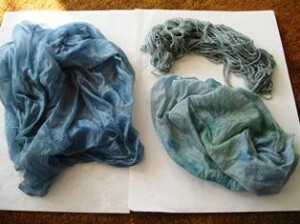 The photos below show some of the materials dyed by students at the workshop. As I have recently been working on an article for “The Journal for Weavers, Spinners & Dyers” on using natural dyes on vegetable fibres, I thought I’d write a few words on the subject here. Some of the naturally-dyed raffia fibres dyed by the basketweavers of Rubona, Uganda. I suspect I am not alone in sometimes finding it difficult to achieve a really deep brown from walnut hulls. 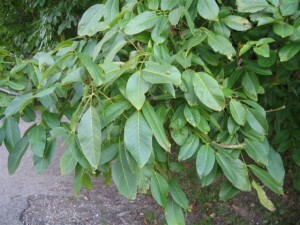 However, one solution to this problem is to use fresh green walnut hulls, rather than dried brown ones. This Autumn I was lucky enough to harvest some walnuts and, after eating the nuts, I saved the green hulls to use for dyeing. 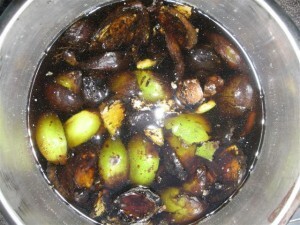 I left the hulls until they had started to become brown before I simmered them until the liquid was deep brown in colour. 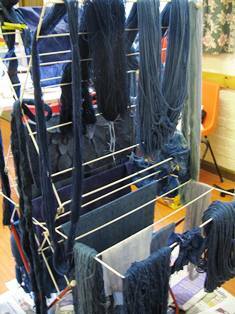 I then strained off the liquid, added some unmordanted wool skeins and simmered them for about an hour. 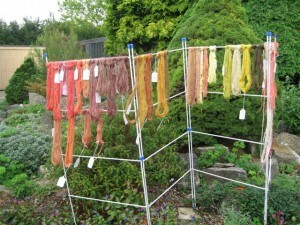 I left them to steep in the cooling dyebath overnight before rinsing and washing them. As can be seen from the first two skeins in the photo below, this dyebath gave a rich deep brown and the exhaust dyebath gave a paler shade. 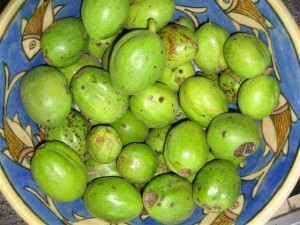 Now I just have to find a reliable source of fresh walnuts each year. However, I should be able to use these hulls for a year or two, as I always save the used hulls, plus their liquid, to use again and again. 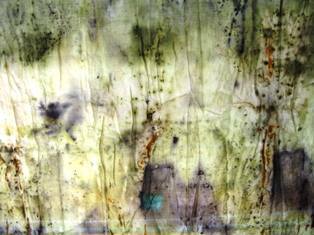 Don’t worry if mould forms as time passes – this will only improve the dye. Last week I led my first workshops in our new local area, working with dyers from several groups in Sussex for two days of plant dyeing. The workshops took place in Stanmer Park, which is a beautiful location next to the University of Sussex, just outside Brighton. The venue for our workshops within the park was the Plumpton College potting shed, which had many stainless steel work tops, a couple of power points and a large ceramic sink, but rather limited space to move around. However, this did have the advantage of making it easy to communicate with everyone at close quarters. We used gas and electric heat sources and obtained a range of colours from madder, weld, rhubarb root, buckthorn bark, indigo and woad, plus one or two plants selected at random from the park. 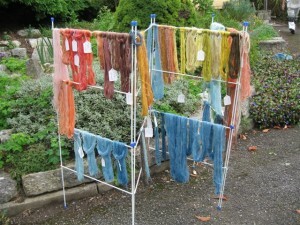 Among the participants were experienced dyers and some relatively new to the craft. The opportunity to share and exchange skills and experiences was appreciated by all of us. One thing I learned is that storing fresh woad leaves in a fridge for over 24 hours may not be a good idea, as the vats made from fresh leaves that had been picked two days before they were to be used were not successful. The kind person who provided these leaves had kept them in the fridge for about 24 hours and I would not have expected this to have destroyed their blue dye potential, although I’ve never stored woad leaves in this way before. As we didn’t want to use them until the second day, we removed them from the fridge in the late afternoon of the first day, poured boiling water over them and left them to steep overnight, ready to use the next morning. Unfortunately there was no way they could be persuaded to yield blues, although some generous participants declared themselves pleased with the yellowish colours achieved from the vat. However, the same leaves were then simmered to produce some pleasant pink-tan shades, so the experiment was not entirely without success. Another successful experiment was with powdered rhubarb root. I made a strong, hot solution of washing soda and water, added the rhubarb root and stirred very well. The solution gradually became a deep red colour and we added some alum-mordanted and unmordanted skeins and left them to steep without heating. (NB Never heat washing soda solutions when dyeing wool or other animal fibres, as this may destroy the fibres.) 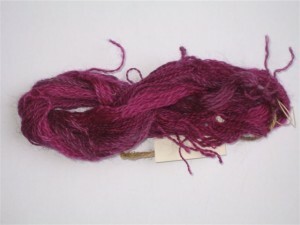 After several hours both the mordanted and unmordanted skeins had become a rich madder-type rusty red. I was surprised to achieve such a rich red shade, as my earlier experiments using this method of dyeing with rhubarb root had produced paler, pinker shades. (See my earlier posts on dyeing with rhubarb root.) I suspect the difference in colour depth was probably because this time I used a stronger concentration of rhubarb root and washing soda. 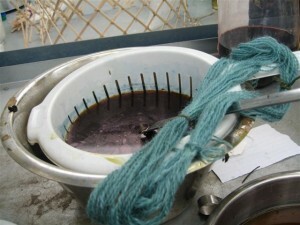 The madder dye bath was made with freshly-dug madder roots, which gave excellent colours. Before use, the root was washed well and we also rubbed off some of the outer bark-like layer. We then chopped it as small as possible and poured boiling water over it. We left the root to steep in the hot water for about 2 minutes, then poured off the liquid into a dye pot. Then we poured boiling water over the same root again and left it to steep as before. Then we again poured off the liquid into the dye pot. (Note: this process removes some of the yellow and brown pigments which can make the dyed colour too rust in tone, rather than red. 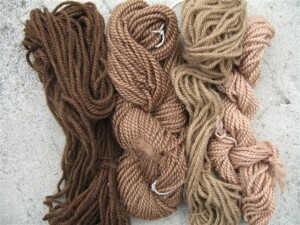 The liquid from these “steepings” can then be used for a further dyebath to achieve coral/rust shades.) This pot of dye solution was put to one side for later use and we returned to the madder root, which we simmered again in fresh water for about 30 minutes until we had a rich red liquid. 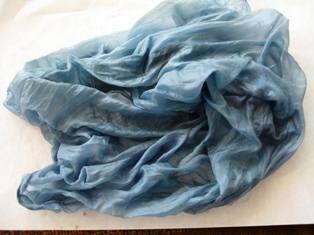 This was strained off and became our first dyebath. We allowed the temperature to cool a little, (if the temperature is too high when the fibres are added, they may become too brown in tone), then added unmordanted and alum-mordanted skeins. 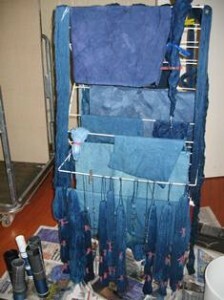 These were left to soak in the dye liquid without any further heat, until they had achieved a suitable depth of colour. 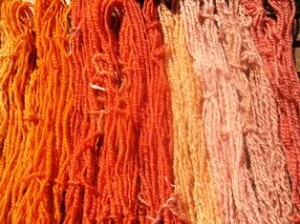 Some of the skeins were then treated in acid, alkaline, copper and iron modifiers, giving a wide range of red and coral shades. Then we used the combined liquids from the first two madder root “steepings” to make a further dyebath, from which we achieved orange/coral colours. 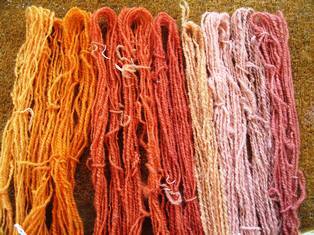 The same madder root can also be re-simmered for another dyebath, which will produce paler shades of coral. The following photos show some of the colours we achieved.